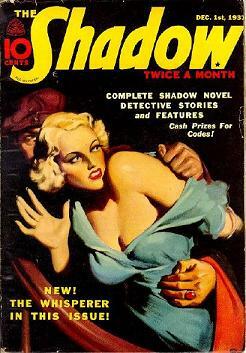 "Death Is An Art" aired on February 11, 1940 and is whole number 88 of the surviving 250-275 The Shadow radio episodes, with over 400 being lost. 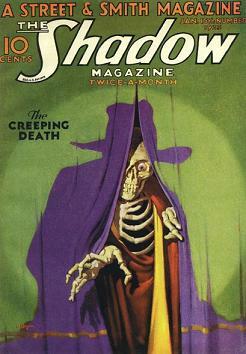 For background on The Shadow, both in his magazine and radio incarnations, we suggest you visit our first The Shadow feature from August 23rd of 2009, showcasing the very first radio episode ("Death House Rescue") from September 26, 1937, with the incomparable Orson Welles as the voice of The Shadow. "Death Is An Art" has The Shadow (and his lovely companion Margot Lane) involved with tracking down a missing person, which inevitably leads them to a psychopathic scientist (the actor doing an admirable job of emulating the iconic voice of Bela Lugosi), and an art gallery—a gallery of all too life-like human sculptures where the failed scientist exhibits his revolutionary "achievements." Horrible discoveries and danger abound as The Shadow once again uses his wiles—and disembodied voice—to scare criminals into making their fatal error. The general theme of an art gallery exhibiting life-like human sculptures is not original to The Shadow, however, as earlier movies from the 1930s used it to quite horrific effect as well, and has cropped up from time to time through succeeding decades in literature and film. Enjoy this episode of The Shadow from early 1940, just over seventy years ago to this month, for while the horror aspect is certainly present, it is somewhat mitigated in retrospect—viewed from the here and now—by the semi-campy (but well done!) Lugosi imitation and the dumb criminals who are so scared of hearing a voice from out of nowhere that they-- Well, you'll hear.